The St. Thomas School journey is an intentionally designed program that thoughtfully and continuously addresses the developmental needs of children - academically, socially, and emotionally - as they advance through the Early Learning Center, Elementary Center, and Middle School. We believe that a child’s educational journey must be balanced between the academic and affective domains. Within the academic domain, core knowledge, skills and understandings are developed across seven primary disciplines. Within the affective domain we put nine core virtues into action. We believe that certain skills transcend specific disciplines and grade levels. Therefore, five core learning skills are integrated throughout the curriculum: communication, technology, thinking, research, and self-management. Academically, students are expected not only to acquire knowledge and skills, but to apply, analyze, synthesize, and evaluate what they learn. In support of growth of character and spirit, students engage in experiences that call upon them to explore, reflect, choose, act, and lead. 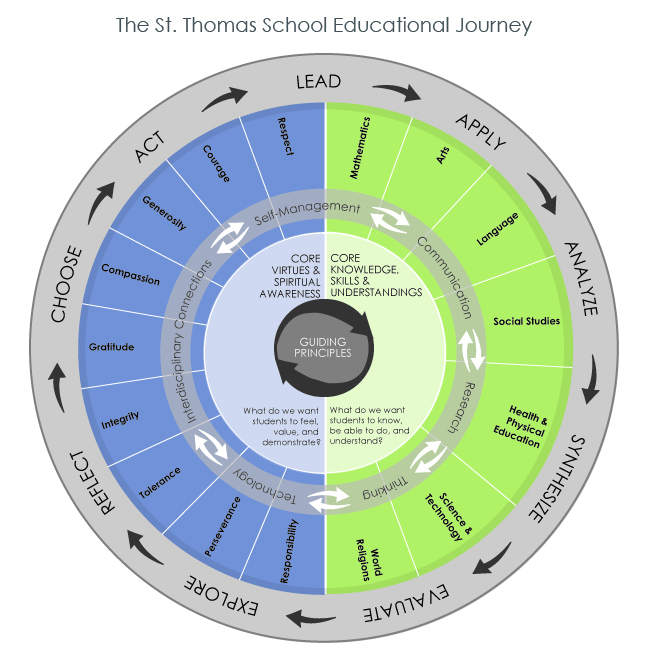 At the heart of the St. Thomas School journey are our Guiding Principles. These beliefs provide a framework on which we base our day-to-day decisions, policies, and programs, ensuring our students and community continue to thrive. All children are expected to become proficient and eloquent in the written and spoken word and in the language of mathematics. Students are expected to establish a solid understanding of core knowledge and skills within the various content areas, including language arts (reading, writing, speaking, and listening), mathematics, social studies, science, foreign language, fine arts, technology, and physical education. We organize core subjects within a framework of cross-disciplinary themes, which help students see connections across subjects and relate what they learn to life. We know that in addition to a solid foundation of essential knowledge and skills within all content areas, students must develop core learning skills in order to be successful as life-long learners and future leaders. We integrate five core learning skills throughout the curriculum: technological, social, thinking, research, and self-management. We integrate five core learning skills throughout the curriculum: communication, technology, thinking, research, and self-management. We develop curriculum through a backward design model in which we identify desired results, determine acceptable evidence, and plan learning experiences and instruction. Through the process of curriculum renewal, we ensure that learning experiences are connected from year-to-year, gradually building a solid academic foundation and a positive, confident approach to learning. Our Chapel and Character program is unique among other schools. Beginning with our daily gathering in Chapel and then woven into daily school life, we explore world religions, identifying our human commonalities and diverse beliefs, and center on a clear set of core virtues: gratitude, responsibility, respect, courage, integrity, tolerance, compassion, perseverance, and generosity. We nurture students' character and spiritual intelligence. The goal is to cultivate students' sense of personal and civic responsibility and an understanding of how their choices and ways of thinking are influenced by their peers, teachers, families, and their own inner voices. We strive to promote excellence in living, as well as learning. Character is taught both by word and deed. Through the curriculum, through school climate, and through service, students are encouraged to apply the lessons of the classroom to the world around them. communicative, disciplined, and caring, with occasions for celebration. Teachers, administration, staff, parents, and students are all in the process of acquiring new knowledge and skills every day. We work hard to nurture a learning environment in which ALL members of the school feel secure in taking risks, asking questions, and exploring new alternatives. Our most important resource is our dedicated team of educators who strive to implement an enriching curriculum that embraces core academics, the development of character, a broad exposure to the fine arts, and physical education. St. Thomas School is dedicated to providing the time and resources needed for teachers to be professionally renewed. Learning is a joyful enterprise! Children are naturally inquisitive and possess an internal motivation to learn about the world around them. They are actively engaged in the classroom, making discoveries and reflecting on their own learning. We are committed to hiring outstanding educators who love to teach! Inspirational teaching begets inspired learning. St. Thomas School cherishes a climate in which creative thought and unique solutions are celebrated.